Charging station almost up and running for EV drivers at Quinta do Tedo!! Windmills stand like sentinels across these boulder-and-shrub-dotted hills. Dams dissect waterways like dominos, irrigating the driest corners of this country. Electricity generated by wind, water and sun currently sustain nearly 80% of Portugal’s electricity consumption and in March 2018, renewables generated 104% (more than enough!) of its electricity consumption. Portugal is a small country (the 11th sunniest in the world!) with big goals to become a leader in sustainability, and plans to eliminate its electricity sector’s greenhouse gas emissions by running entirely on renewable electricity by 2040. It is well on its way! With such ambitious efforts to “go green”, Portugal caught the eye of many electrical vehicle manufacturers. Since 2009, the Portuguese government responded by building a network of electric vehicle (EV) charging stations (currently over 2,000!) across the country. Since 2015, the new (socialist, green-minded and nationally well-accepted) Portuguese Prime Minister, Antonio Costa, increased taxes on “gas-guzzling” internal combustion engine (ICE) vehicles and offered incentives to people buying “energy-saving” vehicles. In the first four months of 2018, EV sales in Portugal nearly tripled. Now, higher-end companies, such as Tesla, have also caught on. Since 2017, Tesla has installed 50+ charging stations across Portugal and one of the most recent additions to its network is right here, at Quinta do Tedo. 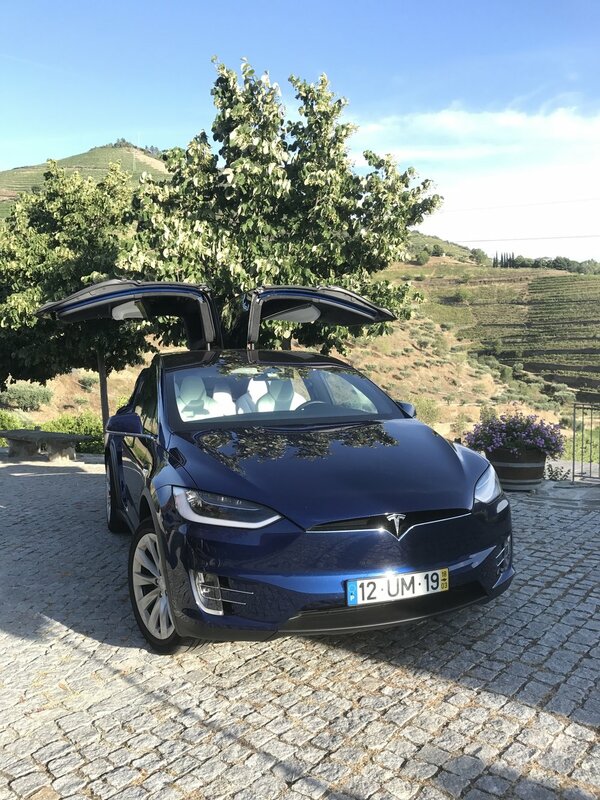 Starting in September, we will proudly accommodate Tesla and other EV owners as the first Quinta in Douro Valley with charging stations, at which guests can “top up” while they enjoy a tour, tasting and/or lunch at our property. This development complements Quinta do Tedo’s ongoing efforts to be more and more sustainable. Since Vincent and Kay bought the property in 1992, we have always honored non-mechanized, sustainable vineyard practices, have been certified for organic viticulture since 2009, installed solar panels for our B and B restoration in 2011 and are currently in the final process to be certified as an organic winery.. Proud to be part of the EV movement! Photo of Sérgio Costa from Portugal EV Tours and Odile when our Tesla Wall Connector arrived. This season, we started working with Portugal EV Tours - a luxury, independent tour agency offering personal tours of off-the-beaten track Douro destinations by locals. At Quinta do Tedo, their customers start with a snack of local cheese and charcuterie, fresh bread and homemade red pepper jam, followed by a vineyard walk led by daughter/naturalist, Odile. Their “Tedo experience” ends with a personal and informational tour of our 18th-century estate and tasting of our Portos. Check out EV Tours' offerings at Quinta do Tedo and elsewhere here for your next trip to Douro Valley and to Portugal. A perfect way to arrive at Quinta do Tedo. We hope Quinta do Tedo’s efforts further inspire more green innovation in Douro Valley and Portugal. With climatic changes and extremes that man can no longer ignore, it is vital to sustainably connect locals and tourists with Portugal’s well-known and off-the-beaten track destinations while benefiting and preserving the country’s nature, culture and economy.